NU: Kinney 31-171, Tagge 17-49, Rodgers 4-27, Olds 4-22, Damkroger 3-23, Dixon 1-2. OU: Mildren 31-130, Pruitt 10-53, Wiley 3-11, Crosswhite 12-59, Welch 8-26. NU: Tagge 6-12-0—65, Rodgers 0-1-0—0. OU: Mildren 5-10-0—137, Harrison 1-1-0—51. 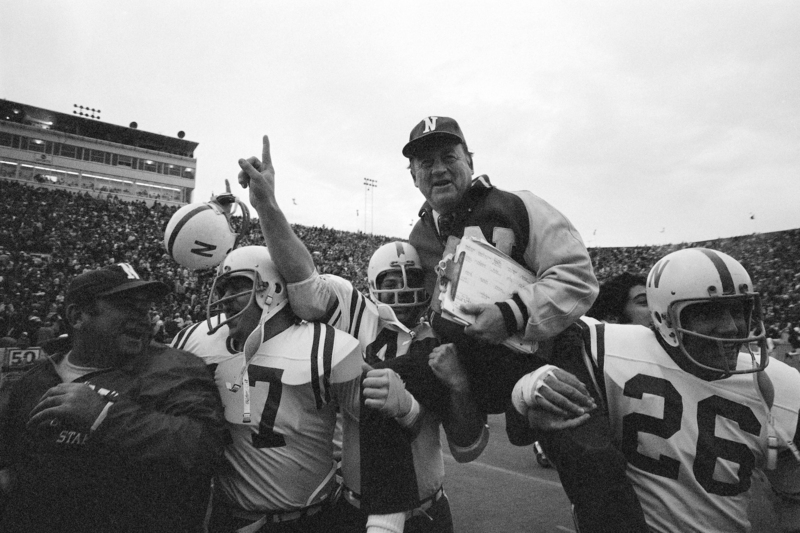 NU: Rodgers 5-61, Kinney 1-4. OU: Harrison 4-115, Chandler 2-73. NU: Glover 3-19-22, Terrio 4-13-17, Jacobson 2-12-14, Blahak 5-8-13. OU: Driscoll 5-6-11, Aycock 2-9-11, Selmon 1-9-10, Pope 6-3-9. It was billed as the “Game of the Decade” and came across as the “Game of the Century.” The Cornhuskers twice came from behind in the second half to pull out a sensational 35-31 victory over Oklahoma and maintain their No. 1 national ranking. No. 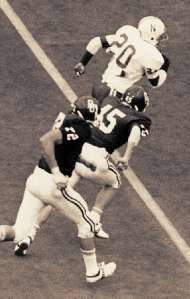 2-ranked Oklahoma, led by a great quarterbacking job from wishbone artist Jack Mildren, gave the Huskers a magnificent battle before becoming Nebraska’s 21st straight victim. 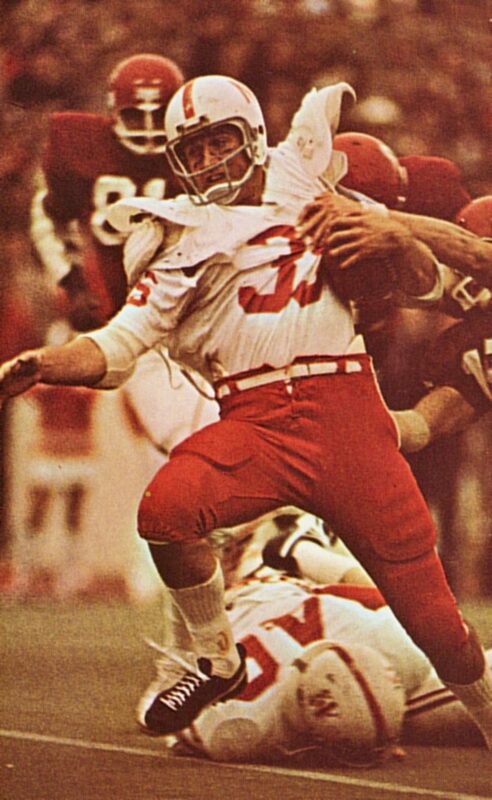 Johnny Rodgers provided the lightning to ignite Nebraska to an early 7-0 lead with a 72-yard punt return, but it was the quarterbacking of Jerry Tagge and the running of Jeff Kinney that sparked the final drive after the Black Shirts — spearheaded by Rich Glover and Outland Trophy winner Larry Jacobson — had blunted but not stopped the wishbone. 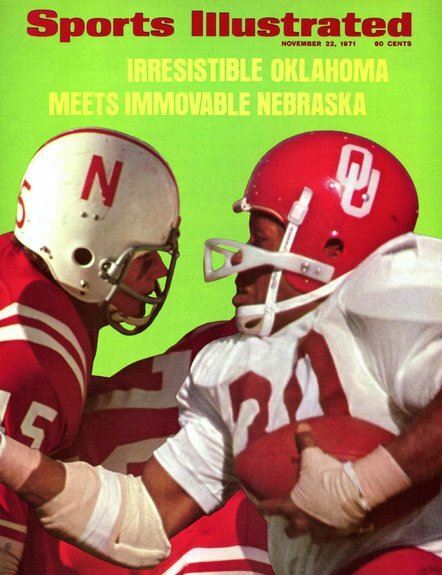 With 7:10 left in the game, Oklahoma took the lead, 31-28, and then the Cornhuskers went to work. Helped by a key third-down reception by Rodgers, the Huskers marched 74 yards in 12 plays for the winning TD. In the final 1:38 remaining for the Sooners, the Black Shirts stopped them cold. They can quit playing now, they have played the perfect game. The cerebral types ... will keep playing it into the ages and wondering whether it was the greatest collegiate football battle ever. Under the agonizing conditions that existed, it well may have been. Oh, man, woman and child, I never thought I would live this long to see this kind of a football game.